I am attempting the Random Quote Generator with React, however I may have structured my components wrong because I have hit a bit of a wall. I have built the random quote machineall in one component but I want to separate the elements to make it more readable and maintainable. It renders a random quote on load but I am not sure how to get a new quote upon clicking the ‘new quote’ button because the buttons are rendered in a component and the author/text is in another component. How can use the functions in the buttons component to interact with elements in the author/text component? Thanks, but this is what I have already implemented with everything in one component. and pass them as props. I’m glad you made it. When you feel your question is solved feel free always to mark the post as solved. thanks! I’m very new to React. I’m trying to build the random quote machine. but instead of hard coding quotes, i used fetch API to get them. 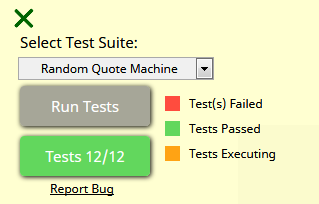 My ‘machine’ can get and display a random quote from API when the GetQuote button is clicked. However, I’ve not figured out the way to get a random quote on the first load?!! I don’t know what did i do wrong or my approach was not right and led to dead end? Could you shed some light on this please? Just after your component mounts it runs this componentDidMount() function automatically right? However a quote is only shown when the clickHandle() function is called. And at the moment that function is only executed when the button is clicked. So you need to think of a way to get that function to run just after the component has been mounted and the quotes have been fetched from the API.